Just How Dark is Dark Matter? Dark matter has only been detected via its gravitational effects. These effects include gravitational lensing and galaxy rotation curves, both suggesting much more mass in galaxies and galaxy clusters than we can see. The most popular explanation for these effects is that about 80% of the mass in the universe is in the form of weakly interacting massive particles (WIMPs), which do not interact via the electromagnetic force, and thus do not interact with photons (hence, dark). 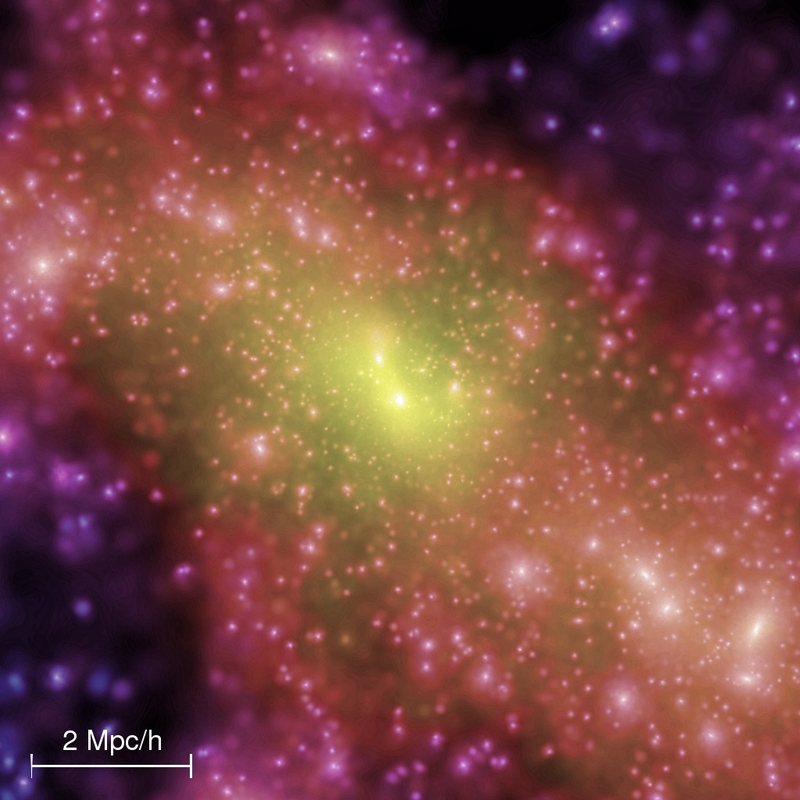 To test this, Davis and Silk propose a new method to quantify the dark matter-photon interaction by looking for extra scattered light in haloes of galaxies. Figure 1: If dark matter and light interact, photons from the bright central regions of the galaxy (blue dashed line) can scatter off of dark matter (light blue dot), deflecting towards the observer. This scattered light adds to the light coming from the outer regions of the disk (orange line), causing an apparent brightening of the outer disk. If dark matter does interact with light, a good place to look for this signal is in the outskirts of spiral galaxies, where rotation curves tell us that dark matter dominates the mass. Here, a dark matter particle might deflect, or scatter, a photon from the bright central regions of the galaxy into our line of sight. This idea is shown in Figure 1. This effect will cause the outer regions of the galaxy to appear slightly brighter than they really are. Measuring this brightening gives an estimate of the probability of interaction, called the cross-section, between dark matter particles and photons. Figure 2: Surface brightness profile of M101. Black points are the data from the Dragonfly Telescope Array. The dashed lines are models for the stellar halo and spiral disk. 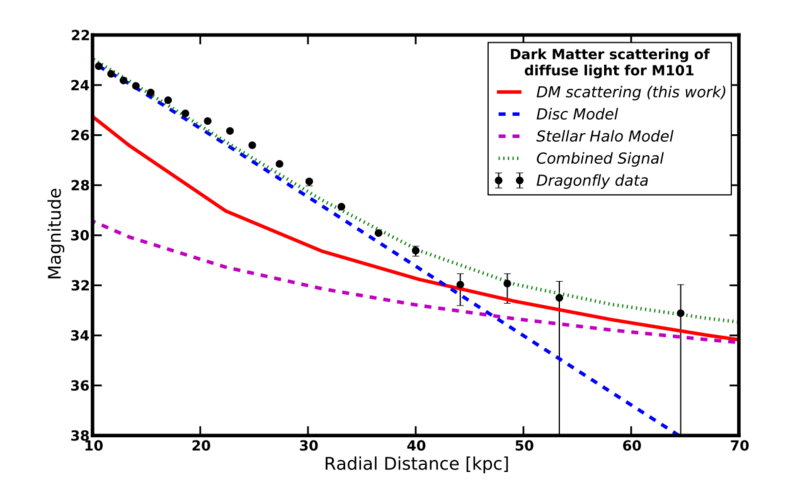 The red line is the contribution due to modeled dark matter scattering, corresponding to the upper limit for the dark matter-photon cross section. The green line shows the combination of all modeled components. The authors apply this idea to the case of spiral galaxy M101. Using measurements from the Dragonfly Telescope Array, the authors fit the optical M101 luminosity profile with an exponential model for the disk and a stellar halo contribution, assuming the dust scattering contribution is negligible. Because the stellar halo also extends to large radii, it is difficult to distinguish between light from halo stars and scattered disk light. Thus, the authors find the maximum contribution to the luminosity profile from scattered light that is consistent with the measurements, shown in Figure 2. This gives an upper limit on the dark matter-photon scattering cross-section of σ(DM−γ) < 10-23 (m/GeV) cm2. The best indirect upper limit for this cross section is almost 10 orders of magnitude smaller than this! To argue that this method is worth exploring, the authors introduce the idea that cross section may increase with the wavelength of light scattered. Figure 3: Spectra of the different sources of light in the outskirts of galaxies. 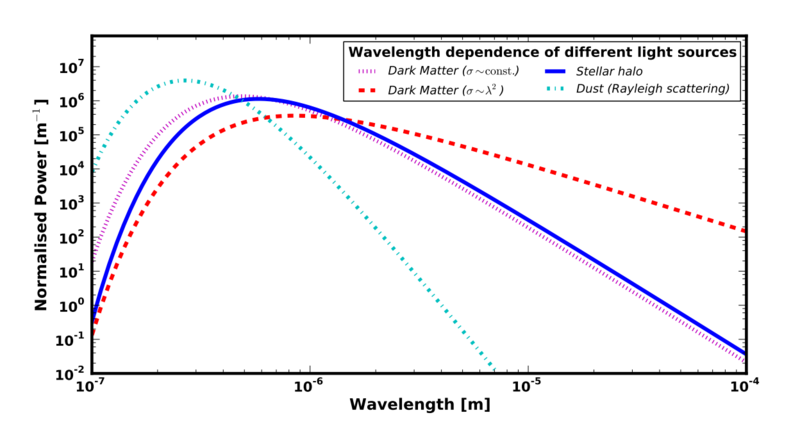 If the dark matter-photon cross section increases towards longer wavelength, light scattered by dark matter (red line) can be more easily distinguished from halo stars (blue line). In some models of dark matter, the scattering cross-section increases with the wavelength of light scattered. In this case, the light scattered by dark matter will have a different spectrum than the light from halo stars, or light scattered by dust. At longer wavelengths, the light scattered by dark matter will become more important relative to the other contributions in the outskirts of galaxies. This point is illustrated in Figure 3. If the wavelength dependence goes as σ(DM−γ) ~ λ4 , then similar measurements of the outskirts of galaxies in the infrared could provide the best limits yet on the scattering cross-section. Also, measurements at multiple wavelengths can constrain the wavelength dependence of the scattering cross-section, potentially ruling out certain flavors of dark matter. This paper is a proof-of-concept that deep measurements of the outskirts of spiral galaxies can place a limit on the interaction of dark matter with light.While the authors come up short of the best upper limit, this technique can be extended to longer wavelengths and larger samples of galaxies, which should provide a better discriminant between light scattering from dark matter and other sources of light. This can be used to distinguish between different models of dark matter particles. Perhaps, with similar methods, we may one day detect a glint of light from the darkest stuff in the universe. Hi there! This is really interesting research. I was wondering why it is believed that longer wavelengths would scatter off of dark matter more than short wavelengths? I was trying to think of an analog to other phenomena, but I kept thinking of sunsets on earth where the relatively shorter wavelengths (i.e. yellow light) get scattered in the atmosphere more than red light does, making the sun look redder. This is very exciting research. I am incredibly excited for the future of astronomy as we get closer and closer to understanding what dark matter really is. Do you think that this line of work could rule out any leading models for dark matter? 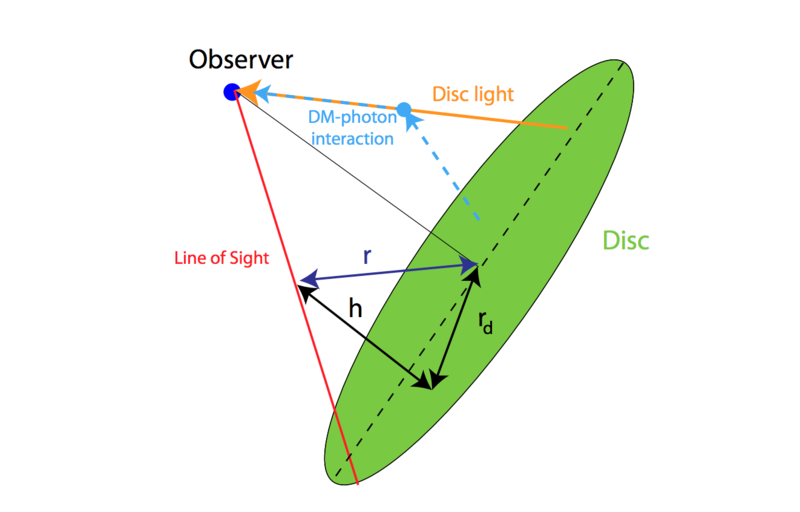 This seems like a very clever method to constrain DM+photon interactions. However, I wonder how natural such interactions are from a particle physics perspective. Perhaps this technique can provide competitive constraints only on rather complicated models of DM. Is the scattering of photons around the edge of spiral galaxies a similar phenomenon to gravitational lensing? Is it fair to think of this scattering as a similar mechanism?